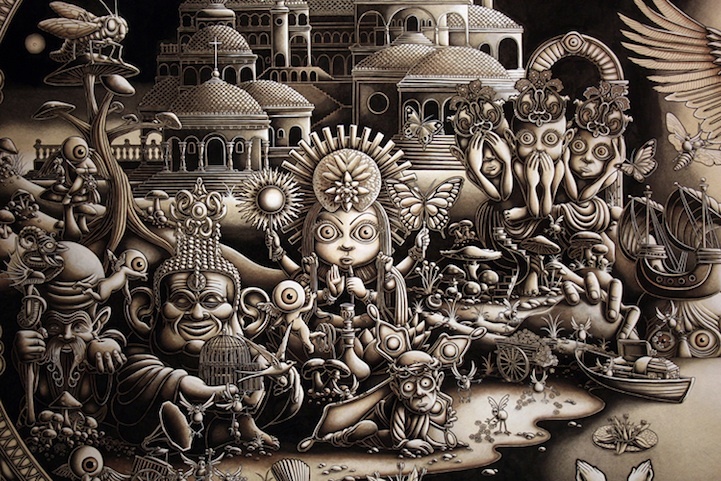 Joe Fenton is an extraordinary skilled artist who create wonders with pencil. Could you ever imagine drawing for 10 hours a day for over a period of 10 months to create a graphite pencil drawing? 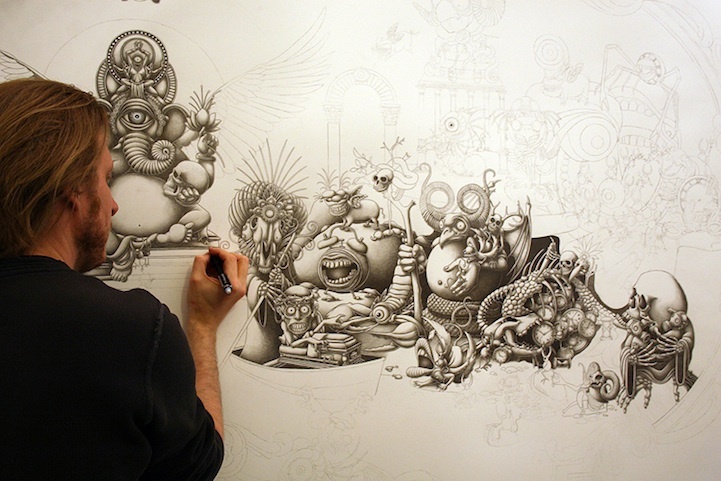 This hard work makes Joe Fenton different from others. His work named as Solitude, which is a personal project that is about 5 ft high and 8 ft wide demonstrates his impeccable drawing skills. He worked out all of the drawing elements step-by-step with graphite pencil on a white paper and then finished it with ink and acrylic. It demands a lot of courage to start a project like this with a huge size and complexity of details. Time is of essence when we talk about such creations. It was his faith and determination that led to the successful completion of such a great work. 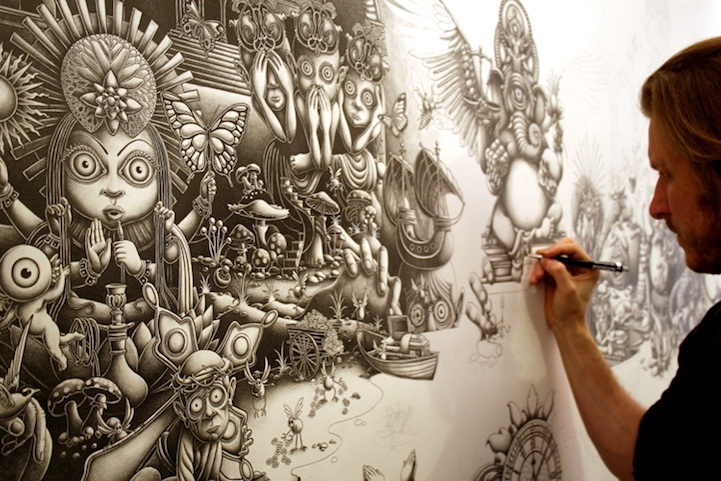 He was inspired by Todd Schorr, the famous surreal artist and illustrations made by Wayne Anderson. The idea of Solitude was born out of the basic concept to join different religions on a single platform. 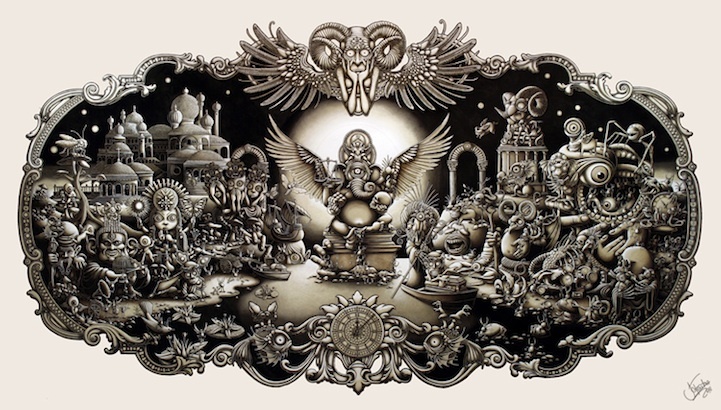 “This might seem strange,” Joe Fenton explains, “as I am not a religious person. He adds that “I’m on a never ending journey to explore a spiritual solution to give the right meaning to my life”. Solitude is an artwork created in 10 months!! This artwork demonstrates his level of determination and hard work. Though you may think as if Fenton has been a trained artist for a major part of his life, he started drawing like this just a year begfore. 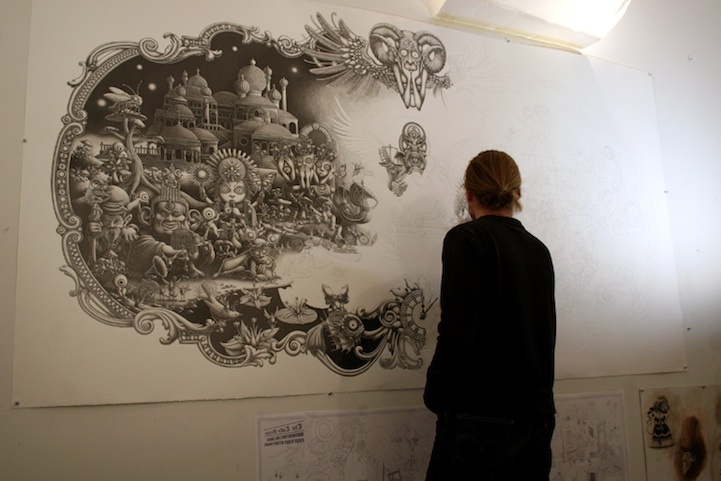 Joe Fenton was a film concept designer and an illustrator before he came to the spotlight as a full-time artist. The very first drawing won him the North West Region’s Best Artist award by the Russell Simmon’s Bombay Sapphire Artisan Series. If you are confused with the medium he used over here, it is nothing other than graphite pencil. But he finished it up with ink and acrylic to achieve perfection. 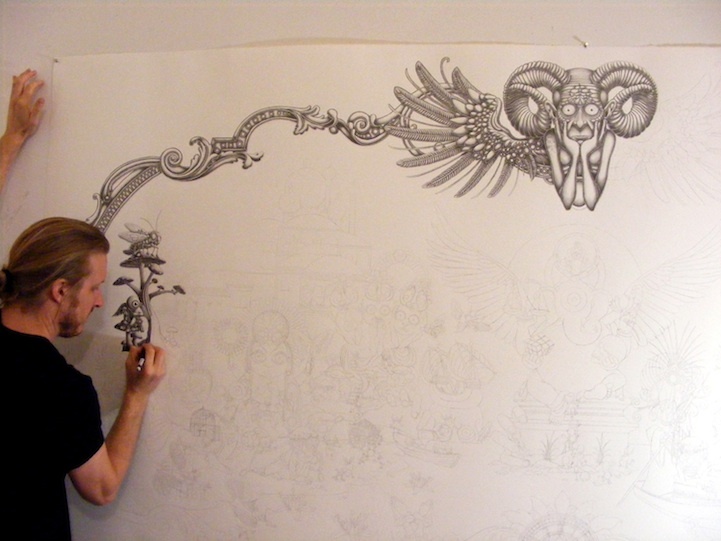 I hope Joe Fenton’s artwork inspired you to try something like this! I was taught a slilthgy different method of contour drawing whereby once you’ve matched a starting point on your paper with a starting point on the object, you never look at your drawing at all until you’ve finished. You simply move your pencil along the paper, recording in 2D the line your eyes see as they move along the edges of the 3D object. This can take some practice and patience as the eyes, brain, and hand learn to work with each other to create a good representation. Dear brother super duper and fantastic . 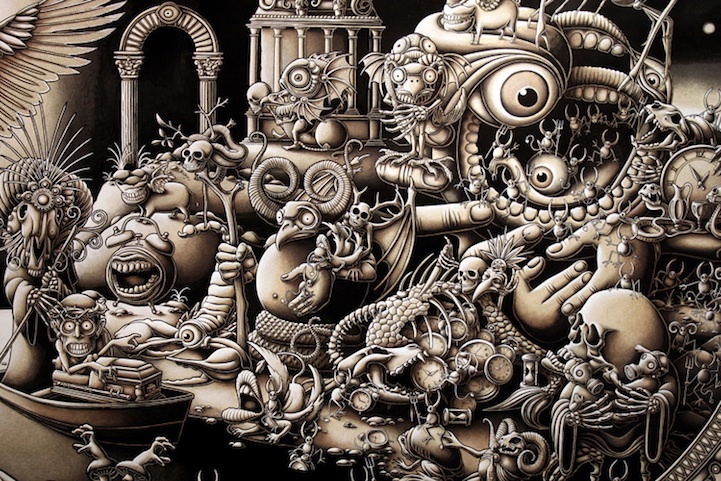 what an art by Mr Joe Fenton like it very much . pls share more like this .